Rated one of the top ten spirits of all time! Prosper Delord travelled around the Armagnac region with only his pot still and his cart drawn by two cows, in the search of a method to produce the finest Armagnac there is. Having aged for at least a quarter of a century in Maison Delord's cellars amongst a thousand other casks enjoying their slumber, each bottle of the Bas Armagnac 25 Year Old is filled and wax sealed by hand on site as it waits to be enjoyed by you. The 25 Year Old earned a score of 96 points from Wine Enthusiast and five stars from F. Paul Pacult's Spirit Journal, which recognized it as one of the top 10 greatest spirits of all time. 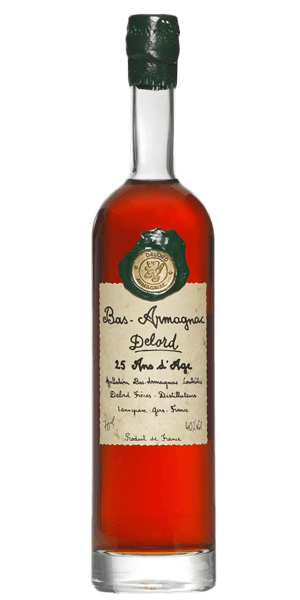 What does Delord Bas Armagnac 25 Year Old taste like? The Flavor Spiral™ shows the most common flavors that you'll taste in Delord Bas Armagnac 25 Year Old and gives you a chance to have a taste of it before actually tasting it. Caramel, sherry, hints of cheese. Dark chocolate, raw cocoa, honey. Fruity finish, a bit nutty. That first drink has more of a kick where the first one (Torres) was mellow from the beginning, still great though. This has been the most delicious brandy I’ve ever had. The smooth taste throughout has made me rethink my end of the day drink. Out of the 3 in my tasting box, this was my favorite. The aroma was full of caramel with notes of sherry. The taste was fully of chocolate, honey, and spicy. I didn't get the fruity finish, but it was a great introduction to Brandy. Soft and sweet at first but very spicy going down. Had to temper this with some water. That helped. Tastes of honey and caramel. Although I enjoyed this, I’d prefer something else. Nose: Honey, oak. After a while, the ethanol notes start overwhelming the more delicate notes. Palate: A strong sherry on the attack. Not sweet enough to be PX, so let's call it Oloroso. Maybe a touch of tawny port. Really, there's not a whole lot else going on, other than grapes. Finish: Strong lingering grape flavor. Not nearly as complex as I'd like from a 25 year Armagnac. Seriously super smooth. Really enjoyed the notes of cocoa and sherry. Warm caramel in the middle is tasty. The ending notes of spice are a little strong...but a fantastic ride I will enjoy every time. It is unusually smooth, yet it retains a rich, complex flavor profile. This is an excellent brandy. Wow! lovely flavor and the bite just helped me to feel like I had a real drink. I enjoyed the hint of chocolate in the flavor also. Good brandy with an initial bite but nice finish and flavor. I enjoyed this one but it had a bit of a bite to it! Lots of flavor but it was a nice brandy. Very spicy, but that’s about it. Whew! Bold bite up front. Smooths our towards the end. Picks up the sweetness very well. Definitely a memorable taste. Its ok - not the best - had better - honestly just a little bland. My wife liked it more than I did. I also compared this spirit, to a bottle of Hennessy XO I have. The flavors are more pronounced in the Delord 25 year old vs the Hennessy XO. The nose is fantastic. It has little to no alcohol burn. From the price perspective, the Delord 25 year old is the better deal; in my opinion.